Holy Saturday is the day before Easter in which Christians prepare for Easter. In The Netherlands it is called Stille Zaterdag. If you translate this literally it becomes Silent Saturday, but this wasn't going to be a silent Saturday for sure. 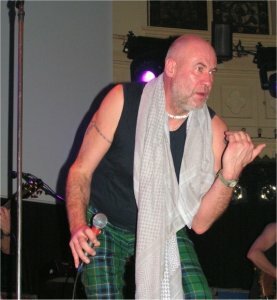 When Fish is playing in the Paradiso in Amsterdam it's always something special. On the same day a Marillion cover band called Lords of The Backstage was playing in a bar, which is ironically called The Waterhole, at just a two minutes walk from the Paradiso. The band played lot's of classic Marillion songs which were sang-a-long by fifty throats in a cosy atmosphere. Although the Paradiso wasn't sold out it was time for a quick snack to be sure to arrive in time for a good place close to the stage. Glyder, a four piece Irish rock band, was the support act. Their sound is a lot like Thin Lizzy with a bit of The Darkness and The Ramones thrown in. I was afraid their style would be a bit out of place but they received a warm welcome. Then suddenly without warning Fish entered the stage. No intro tape or suspense increasing delays, the big man just walked on the stage. The audience was a bit stunned by this sudden appearance. Fish collected his warm welcome and one by one he introduced the members of his live band. Foss Paterson on keyboards, Steve Vantsis on bass, Gavin Griffiths on drums, Chris Johnson on guitar and Frank Usher on guitar. Only three months ago Frank Usher suffered a heart attack and the crowd was well aware of that fact. 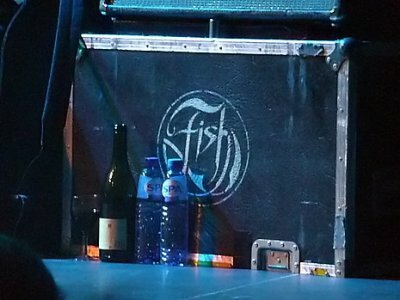 In an interview Fish promised Frank Usher would get his well deserved applause but the Paradiso didn't wait for his signal and cheered him loudly. Someone must have told him about the fact that Red wine provides health benefits for your heart, he held on to a nice bottle while entering the stage. The setlist contained mostly songs from 13th star and Clutching at Straws. Images and live footage was displayed on a large screen behind the band. Funny thing is that Fish is so big that he actually looked smaller on the screen. When he held his hands in the air the shadows touched his own projection. On the screen both old and new material were accompanied by images and computerized graphics. During Dark Star the cover artwork by Mark Wilkinson really came alive when the 13th star boat sailed across a swelling sea. The new album 13th star is heavier than his earlier work and by using two guitar players live those songs really rocked. About the quality of this live band I would not know where to start, probably the best one he has ever had. 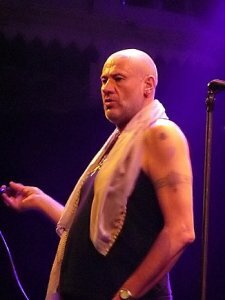 Fish was clearly having a great time and the audience in Amsterdam was as always responding in a very enthusiastic manner. Dutch crowds are known for the fact that they sing-a-long loudly and during So Fellini and Warm Wet Circles they lived up to that expectation. Fish is also great at entertaining a crowd which he proved with a story about an encounter he had with Darth Vader at the Dam Square in Amsterdam. Fish was laughing a lot but also serious at times. His intense monologue at the end of Square Go was done with so much aggression it scared me. More grabbing was the story about his friend and guitar player Frank Usher when he suffered his heart attack. He received his very special applause right before Clich� during which he again showed that he is a marvelous guitar player. After closing his first encore with Incommunicado the crowd demanded more and he returned for a second encore. Last Straw was a fantastic ending to a brilliant show. Before closing I would like to make a special remark about the sound. For the first time I could listen to a band in the Paradiso without having to wear earplugs. The sound was absolutely brilliant, both quality and quantity.